The British Government undertook a series of nuclear tests at various sites in the South Pacific between 1952 and 1958. Associated with these atmospheric tests was an experimental programme, conducted largely at Maralinga in Australia, in which radioactivity was dispersed into the environment. This programme ended in 1963 although clean-up operations continued through to 1967. In total, ~22,000 British troops took part in what was the largest military undertaking since WWII. Operation HURRICANE was carried out in October 1952. The objective of the test was to investigate the effects of an atomic explosion in a harbour and to this end, the explosive devise was placed in HMS Plym which was anchored in the shallows of Monte Bello Islands. Operation TOTEM 1 and 2 were carried out in October 1953 and took place at Emu Field just north of Adelaide. The tests involved explosive devices mounted onto towers with the aim of developing greater knowledge of fission weapons and, the effect of blasts on military equipment and the local environment. Operation MOSAIC G1 (May 1956) and MOSAIC G2 (June1956) were tower mounted devices that took place in the Monte Bello Islands. The aim of this Operation was to support the development of thermonuclear weapons. Operation BUFFALO involved a series of four tests that took place on the Maralinga test range in September and October 1956. These tests were either ground, tower mounted or air-burst detonations and were designed to test various parts of the warhead, gain scientific data and, to ‘indoctrinate’ Officers by witnessing the effect of blasts on military equipment. The Minor trials and experimental programme took place on the Maralinga test range between 1955 and 1963. The purpose of this programme was to test individual components of explosive devices, the dispersal of radioactivity and the effect of an accident, such as a fire, during weapon transportation. Operation GRAPPLE 1, 2 and 3 were air-burst detonations that took place between May and June 1957 over Malden Island (~400 miles from Christmas Island in the South Pacific) and represent the testing program for the development of Britain’s first thermonuclear hydrogen (H) bomb. Operation ANTLER involved a series of two tower mounted and one balloon test of component parts of the explosive devices and took place on the Maralinga test range between September and October 1957. Operation GRAPPLE X and GRAPPLE Y took place in November 1957 and April 1958 respectively just off Christmas Island. These Operations are recognised as the first successful British airburst H-bomb detonations. 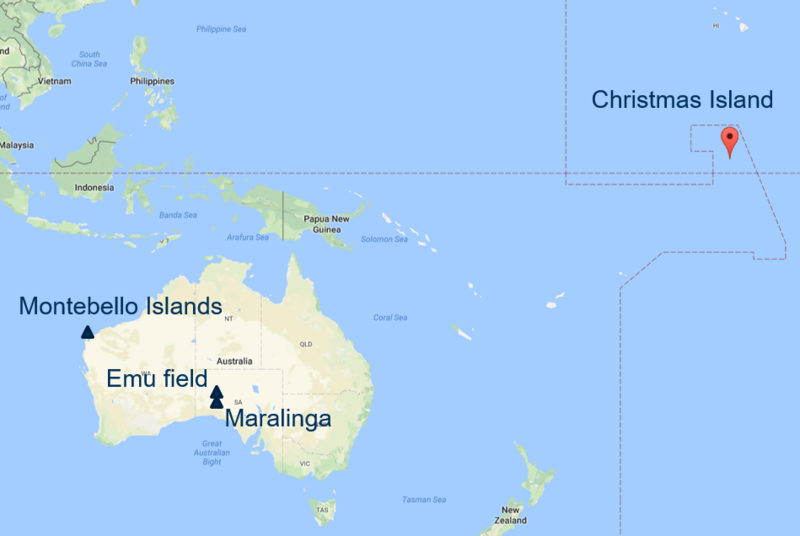 Operation GRAPPLE Z1 (August 1958) and Z4 (September 1958) were balloon bursts that were detonated on Christmas Island while Operation Z2 and Z3 (September 1958) were H-bomb air-burst detonations just off Christmas Island.